The rapid growth in the illegal killing of African elephants seen since 2006 seems to have stabilised and may be decreasing. Two new reports indicate that across the continent, the numbers of elephants being killed for ivory has slowed. But the picture is mixed as the slaughter in Central and West Africa shows no sign of moderating. 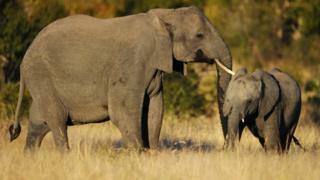 Some experts believe that the decline in deaths could be down to fewer elephants being alive to poach. The BBC investigated the war on elephants earlier this year and how it is fuelled by demand for ivory from Asia. Now there is new data on the sources of the illegal killings from the Convention on the International Trade in Endangered Species of Wild Fauna and Flora, better known as Cites. They run two important elephant monitoring records that are seen as reliable indicators of what's happening on the ground. A few months ago, the Mike programme (Monitoring the Illegal Killing of Elephants) showed that number of deaths, which started to grow in 2006, peaked in 2011. Even though the trend is moving in the right direction, there were still over 14,000 elephants killed in the period from 2003-2015. The BBC also investigated the war on elephants this year and how it is fuelled by demand for ivory from Asia. New data has also been published for the ETIS programme (Elephant Trade Information System). This shows that while trading in illegal ivory reached its highest levels in 2012 and 2013, it had levelled off by 2014. But while there are some positives in the overall picture for Africa, the regional differences are stark. Southern Africa is the area where poaching levels have remained consistently the lowest. It remains the only sub-region that has not seen illegal killings exceed natural deaths since monitoring began. Poaching remains high, however, at the Niassa Reserve in Mozambique and there has been a "troubling spike" in killings at South Africa's Kruger National Park. East Africa has also seen a decline in poaching for the fourth year in a row. Central and West Africa continue to show the most serious levels of poaching, with illegal killings far exceeding natural deaths. "There are some encouraging signs, including arresting the overall upward trends in poaching, the decline in poaching trends in some sites in East Africa and the overall trends in Southern Africa," said Cites secretary general John Scanlon. "This shows what is possible through a sustained and collective effort with strong political support, but much more remains to be done." However others say that there may not be much comfort in the relative stability that the new figures indicate. "It needs to be understood that poaching levels may be down but in some cases that is due to the fact the populations are severely depleted," said Dr Susan Lieberman from the Wildlife Conservation Society (WCS). "If you look at some of the Central African populations that have lost up to 70% of their elephants you may see poaching stabilise or decrease but that is because the elephants are harder to find." The future for elephants will be a major topic of debate when 182 countries gather at the Cites triennial Conference of the Parties in Johannesburg at the end of September. At present all commercial, international trade in ivory from African elephants is prohibited. A one-off commercial sale of ivory from Botswana, Namibia, Zimbabwe and South Africa took place in 2009. Both Namibia and Zimbabwe are now proposing changes at the upcoming meeting that would allow ivory from these two countries to be internationally traded subject to permit. They argue that that these sales would help boost their conservation efforts. Critics of these moves are concerned that any permitted trade would be used as a cover for illicit ivory and would boost poaching across the continent. "As long as there is some signal that there may be a legal ivory trade, these speculators, traffickers and crooks are going to take advantage of it," said Dr Lieberman from WCS. "We've got China now saying its going to close its domestic ivory market, the very worst thing that could happen would be for the Southern Africans to get a nod that maybe you can trade in the future. "That would be the death knell of elephants in Central, West and East Africa." Follow Matt on Twitter @mattmcgrathbbc and on Facebook.